Rialto Theater in 1937 shortly before opening night. The photo in the inset is of the first manager, Norman J Beauparlant. Kennebec Journal Photo. There was a time when enjoying the film industry’s Hollywood’s finest offerings didn’t require a trip across town to a multiplex or a subscription to a high-priced cable service. All it took was a walk downtown and as little as ten cents. 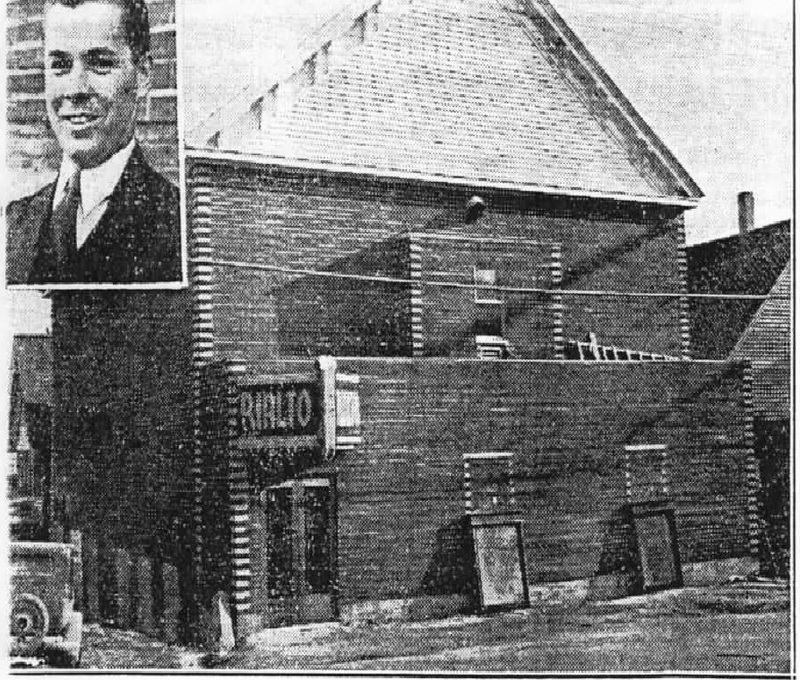 Movies theaters could be found in even the smallest cities like Hallowell where the Rialto was the gateway to adventure. Memories of hometown film venues are fading fast. 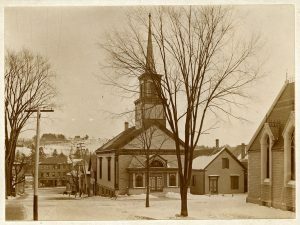 A committee charged with documenting and preserving those memories in Hallowell is invited those who attended movies at the Second Street theater to share their reflections at a Remembering the Rialto Roundtable Saturday, March 11 at 2PM in the Hubbard Library. A video recording of the panel discussion is being edited and will be available for viewing in the fall. The project grew from an inquiry by the current owner of the building who wondered about the theater and what it looked like. The only known photograph of the theater appeared in a Kennebec Journal article announcing the opening. 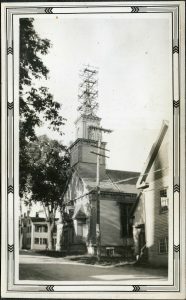 The Universalist Church, Second and Central Street from about 1900. Emma Clark Weeks collection. The building was constructed in 1843 to be the home to the Universalist congregation worshipping in the city. 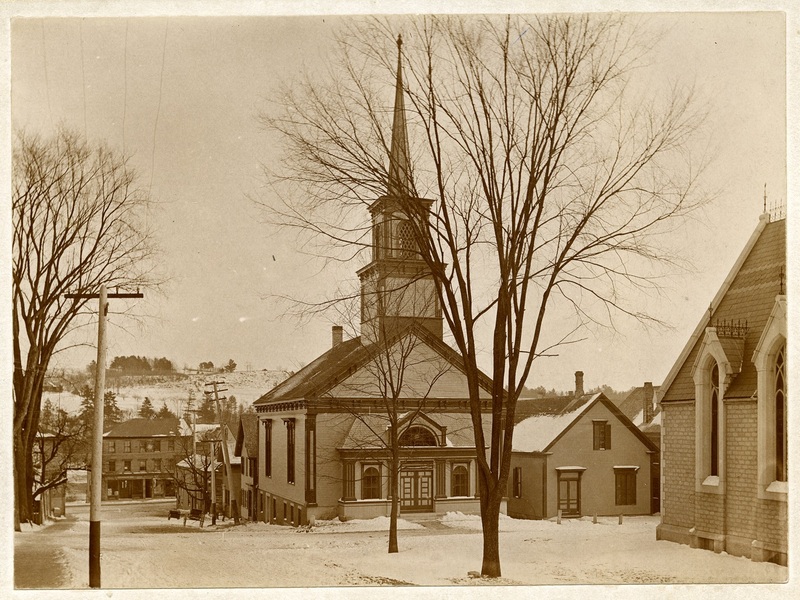 It served as a church until the local congregation merged with Augusta Unitarian Church. The steeple being removed in 1934, before being remodeled as the Rialto Theater. Photo from the Emma Clark Weeks collection. The building was remodeled as the Kennebec Journal article described prior to the opening. “The interior of the auditorium is modernistically decorated with light fixtures of a modern design placed on circular plaques.” Local artist Chris Cart will use these descriptions and those from roundtable participants to guide his creation of illustrations depicting the interior of lobby and theater itself. 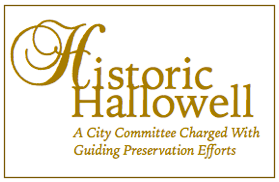 The Historic Hallowell Committee was created by then Mayor Charlotte Warren to guide the creation of policy and practices regarding the collection, preservation and display of the City’s historic artifacts and related properties; to prioritize and coordinate historical projects and to promote historic preservation efforts. “There was concern that some of the City’s historically important items were at risk,” according to Sam Webber, City Historian. “A number of paintings including some of buildings along Water Street by local artist Sylvia Hudson of buildings have come up missing. Also, signs about the Benedict Arnold Expedition that used to be at the turnout by the river were lost as well.” The Historic Hallowell Committee hopes that someone has photographs of these items they could share. The Committee is meeting the third Thursday of the month in the Hubbard Library at 4:00PM. Anyone interested in Hallowell History is invited to attended. For more information about the committee can contact Bob McIntire 207-629-9180.